This entry was posted on Sunday, March 5th, 2017 at 6:57 pm	and is filed under Charles Cameron, map, media, media literacy, Uncategorized. You can follow any responses to this entry through the RSS 2.0 feed. Both comments and pings are currently closed. NPR and BBC are “mainstream”? Maybe if we could slide the columns & attached designations from side to side, stopping when one’s own position was right down the mid-line, people on both left and right (not to mention center?) would appreciate it more? I’m sure there must be other maps that would suit right & left better, and would be glad to see them posted here. To me, the attempt is significant, the approach of attempting to see the overall bias landscape. NPR is thoroughly liberal of a northeastern urban species and the BBC is more or less where the Guardian is ideologically even if as a government owned system they are nonpartisan. I know few liberals who would bother to argue NPR is right of center or center in the American context. At least these maps — and the Allsides site — try to facilitate that attempt. Maybe I should ask, Lex, Zen, do you have any heuristics for getting a fair balance of views, and how do you sift them? Yes. I look at credibility more than ideology in terms of taking a story seriously. I laugh at TNR for example. It’s articles are almost always empty-headed agitprop of the true believer PC variety but Mother Jones, despite being further Left than TNR, sometimes does very good reporting with far more intellectual honesty. Not everything they publish but more often. 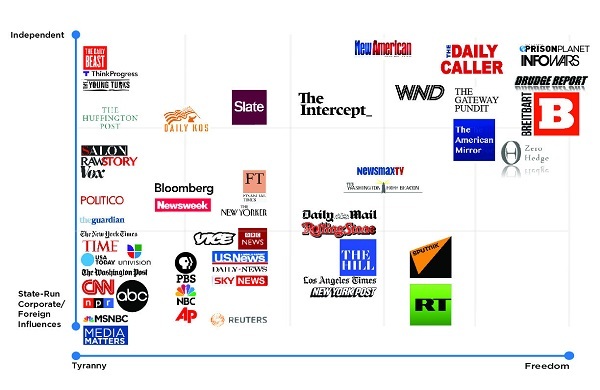 I also like to look at foreign press views of America bc they are more isolated from the in-group journalistic herd instinct of American media and see us with different eyes. As a rule of thumb, I only trust local journalists, preferably those reporting on crime. At least I know it’s unlikely they’re getting paid off to report fake news. The mob, unlike politicians, don’t like publicity good or bad. I don’t know, but I have a feeling that the center has moved so much that it might take in both NPR and Guardian now. The Right has grown so powerful and the Left has increased so much in mass that the center is now somewhere between the powerful and popular, which pretty much describes NPR and the Guardian. The “center” line presumably shifts as the Overton window shifts, and perhaps “balanced” shifts with it — but “unbiased” or “true” should remain 9n place no matter how opinions shift, no? The media definitely follows the Pareto 80/20 rule. 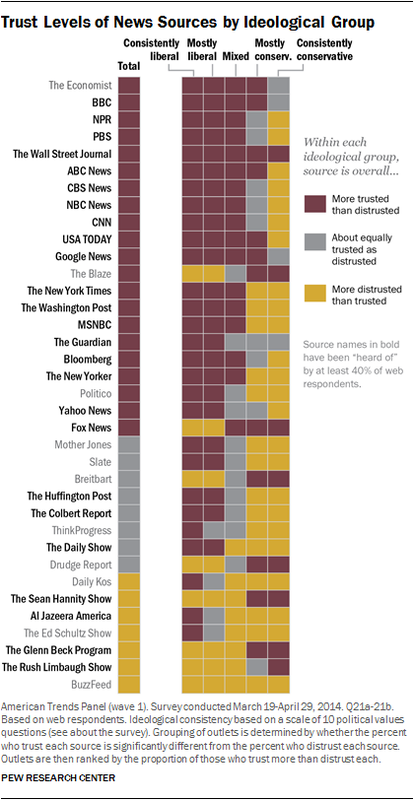 About 80% of the media is Leftist and 20% is Right. 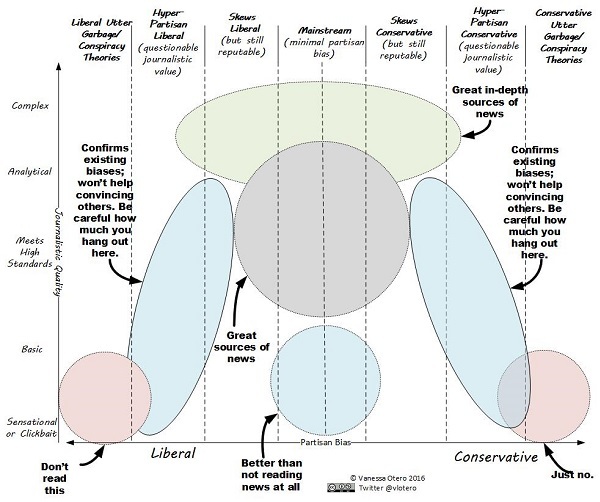 To put Larry’s observation in Boydian terms, because of this distribution the Right oriented media has to emphasize maneuver and Auftragstaktik, while the Left media concentrates on mass and Schwerpunkt. Experimenters played a video of protesters being dispersed by police and asked viewers whether the protesters were peaceful or violent. Even though everyone watched the identical action onscreen, viewers’ perceptions varied with their political beliefs. When the experimenters described the protesters as anti-abortion activists, viewers with liberal leanings saw the protesters’ actions as violent, whereas the more conservative subjects saw them as peaceful. Conversely, when the experimenters said the protesters were gay rights proponents, the liberals saw a peaceful protest and the conservatives saw a violent one. Every perception, no matter how objective it seems to the witness, is infused with personal beliefs. I just read the experiment, and that isn’t quite how it went. Instead of the dualistic liberal and conservative, they used a measurement consisting of four poles: hierarchical individualism, hierarchical communitarianism, egalitarian individualism, and egalitarian communitarianism. So they employed a ‘four-fold vision’, as you have discussed in the past. They even measure in terms of how the views shift from one pole to the other, illustrating cultural cognition is in a state of movement and activity. The divisions among the groups were pronounced, except for one thing. The hierarchical individualists and the egalitarian communitarians were both almost evenly split on what they thought of the abortion protests (page 31). They barely mention this surprising result, but it seems to be damaging to their premise. Which doesn’t seem too bad, but that part about regulations advancing interests sounds like an oxymoron to me. If cultural values can’t be used then how will they know which interests are good enough to advance? But the study’s results on the abortion protests causes some problems here. If the diversity of doctrines is indeterminate or uncertain than it will be impossible to maximize utility by finding a consensus. Speaking of John Rawls, he is why I think Obama actually believed the Pennsylvanians became bitter clingers only after they lost their jobs. I do think many on the Left believe, such as with Hillary’s verdict about unredeemable Deplorables, in a neo-Calvinist doctrine in which a large segment of the rural population has been pre-selected for damnation. However, Obama looked to me to be an adherent of Rawls’ doctrine of Original Position, which was a progressive update of social contract theory/noble savage mythology. The natural situation of society is to arrive at rational principles of social justice and equitable economic arrangements. Cultural institutions such as religion corrupt rationality and social cooperation. In order to overcome the corrupting influences of culture, the collective must impose mandates to coerce individuals away from unfairness and towards equality. Positioning The Economist on that side of the line is true only if the entire basis of the division between liberal and conservative is the free market. That division, and positioning The Economist’s view of it on the centre-right, is a period piece at this point. The Economist’s intellectual bright line has always amounted to the most refined and commercially driven form of Whiggism/Liberalism possible. That has typically included the most gung ho possible attitudes to free trade, but it has also always included political and social liberalism on anything else. As well as a very teleological approach to history, technology, social progress and so forth. Through the 19th century and into the 20th, this put them mainly with the Liberal party in Britain. The politics of the 20th century put them for a time in the Conservative camp during the high tide of Thatcherism/Reaganism, but even then it was always conservative only in the sense that free trade was then understood as ‘conservative’. I doubt seriously many Economist editors ever thought of their project as a Conservative, let alone conservative or ‘Tory’ one. Now once again they are privileged that their preferred attitude to trade, its cultural and political parallel ideas and consequences, and social views are once again in closer alignment. The Economist is never going to be fake news. They are orders of magnitude too professional for that. But they produce few things without an editorial line in both selection and content. And that line is not on the right. Never wholly was. Consider their editorial creed, printed on the contents page of the magazine, and to be found in every issue, newspaper or magazine, from day 1, which proclaims it has been founded to take part in “a severe contest between intelligence, which presses forward, and an unworthy timid ignorance obstructing our progress.” I am about 80% confident I reproduced that correctly from memory, having not checked for some time. It is a powerful statement. In effect, The Economist is Macaulayan Whiggism power projection into the 21st Century. Putting it anywhere on the right is self-discrediting. 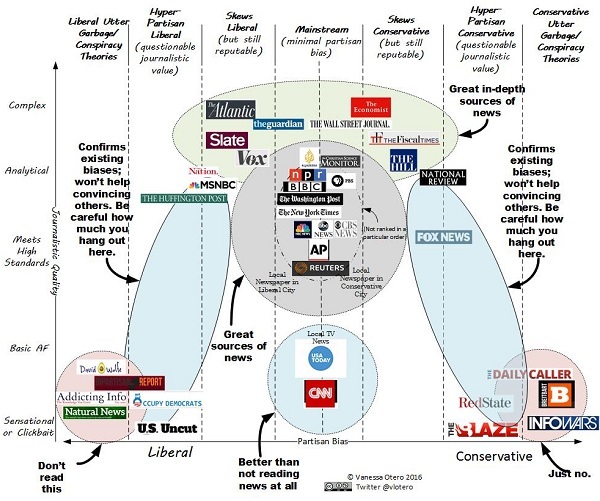 So one problem with the map above is that some people, and some news outlets too, perhaps, don’t see all things from a single perspective, liberal or conservative — and thus different people will p;lace a given news medium in different places depending on which aspect of re;ality they are most concerned with — or see, as it were, a blur of two versions of the map, perhaps. In this age of schismatic political arguments, there has been no shortage of attempts at compromise. In his debut book, Bragg tries to harmonize the two warring parties by combining the embrace of free markets and fiscal restraint typical of the right, and a socially liberal tolerance that has become the progressive signature of the left. Bragg lucidly catalogs his policy points in quick succession, hitting all the key issues. The author largely agrees with conservatives that the power of free market economics needs to be harnessed to produce wealth and redress increasing inequality, which would mean that liberals need to repair their toxic relations with the world of commerce. But he castigates conservatives for betraying their own libertarian principles by insisting on intrusions into the public sphere when it comes to issues like religion, homosexuality, and abortion. Often, the position Bragg endorses is a moderate amalgam of both political perspectives.